Bulgan aimag. Places to visit to Bulgan aimag. Region of Mongolia. Aimag. Aimak. Mongolia city. Place to visited in region of Mongolia. Sights of intersest. Number of somons - 16. 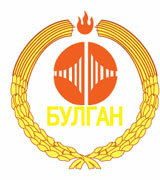 Bulgan aimag was established in 1938. Bulgan aimag is situated in the North, in the territory of the Khangai mountain forest steppe zone. Bulgan aimag borders on the North with the Russian Federation. Bulgan aimag is a curious mixture: the south is dry grassland and the north is green and has enough forest to support a small timber industry; scattered in between are about 50,000 hectares of wheat and vegetable crops - Mongolia's agricultural heartland - and Erdenet, Mongolia's largest copper mine. The ethnic groups comprise Khaikh, Buryat and Russians. Mongolia's largest river, the Selenge Gol, crosses the aimag's north, and the Orkhon and Tuul rivers meander around the southern parts. Coniferous trees, fruits and medical herbs such as berry, goosberry, hippobophae, plantago, great burhet, peony species of artemesia and thyme grow in the fertile soil. Mixed forest occupies about 30 percent of the aimag's territory. Elks, bears, deer, white antelopes, boars, musk deer, lynxes, squirrels, marmots inhabit the area. Bulgan aimag is rich in beautiful places, such as Eg-Selenge, Eg-Tarvagatai meadow,Uran-Togoo, Khugnukhan. Khuiji, Uurt and other springs of the province are popular destinations. Of historic memorials there are remnants of old Stone Age, ruins, and the site of Baibalyk, the ancient city of Uighur State, and the ruins of the residence of prince Tsogt. 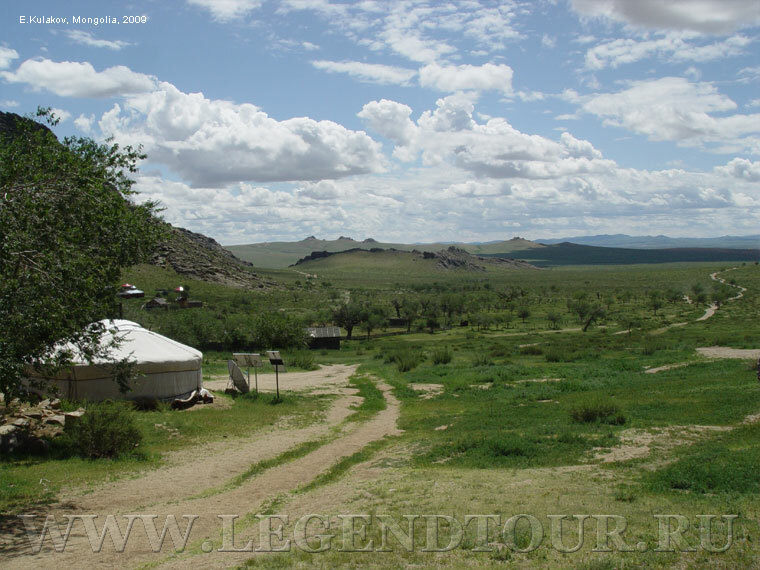 Bulgan is a famous area of pilgrimage of Mongolians due to its historic places. The main sector of economy is agriculture. The aimag takes the 3rd place in the country for its farming. The local industry produces a broad range of products including foodstuffs, gold, consumer and export goods. Average annual industrial output reaches 1.9 billion tugriks. Over 70 percent of aimag's budget comes from local revenues. Bulgan. Population 13,000. Elevation 1208m. A small aimag capital, the city of Bulgan has long been known to foreigners as an overnight stop midway between Ulaanbaatar and the ever-popular Khovsgol Nuur. If you've been traveling in central or southern Mongolia, Bulgan city may impress you with its conifers, log cabins and absence of gers, though there's little reason to linger. The Aimag Museum on the main street has some information on obscure sights in the aimag, a display on J. Gurragcha, Mongolia's first man in space, and some interesting old photos. The Museum of Ancient Things (Ugsaatny Zizuyn Salvar) has a few ethnographical exhibits. 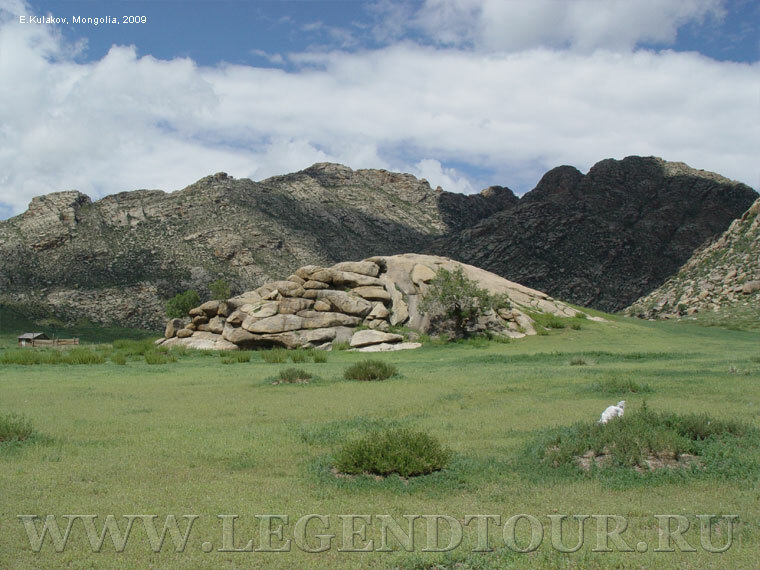 There are a couple of obscure historical monuments around Bulgan. About 20km South of Bulgan, just East of Orkhon are seven standing deer stones, so called because the stones are carved with reindeers and other animals. The stones, known as Seeriyn Adigyn Bugan Khoshoo, mark what are thought to be Neolithic grave sites. About 25km North of Bulgan is a Imtall Turkic balbal (Turkic grave markers), known as Zunn Turuuniy Khun Chuluu. Hogno Haan uul. 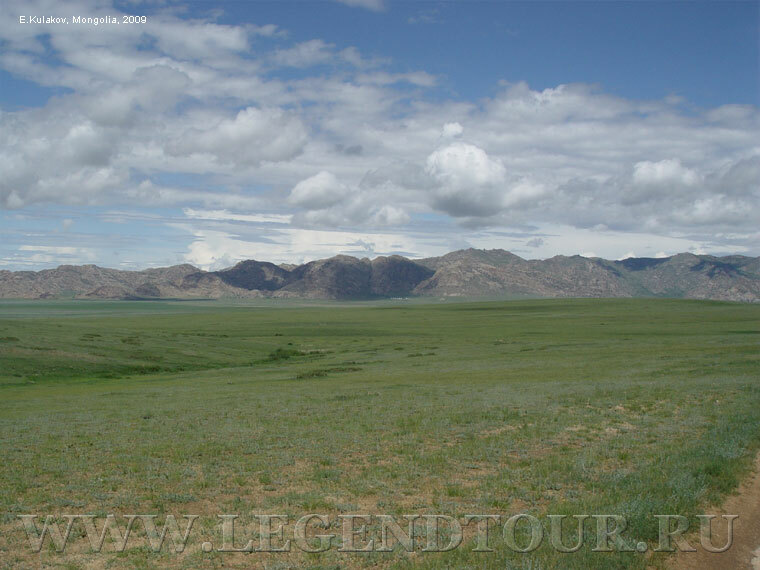 Although it's just off the main Ulaanbaatar-Kharkhorin highway, this nature reserve sees relatively few visitors. Its arid terrain of rocky semi-desert is good for short hikes and there are a few old temples to explore, both ruined and active. At the southern foot of the mountain are the ruins of Ovgon Khiid, built in 1660 and destroyed (and the monks massacred) by the armies of Zungar Galdan Bochigtu, a rival of Zanabazar's in 1640. About 10 monks reside here in the summer months. The head lama is a charming woman who professes soothsaying abilities. Ovgon-Khiyd Monastery. The monastery is located in the mountains of Khogno-Khan 257 km away from Ulan-Bator, on the way to Arvaykheer, 173 km away from Arvaykheer and about 75 km away from Kharkhorin. Uran Uul & Togoo Uul. About 60km directly west of Bulgan city is the extinct volcano of Uran Uul and nearby Togoo Uul, now part of the 1600 hectare Uran-Togoo Tulga Uul Natural Reserve in the sum (district) of Khutag-Ondor. Uran Uul is a pretty good place to break the journey to Khovsgol, though the flies in this area can be intensely irritating. Trails to the top of the relatively unimpressive volcano lead up from the west side, which also has some nice camping areas. Bugat. If you have rented a jeep with a driver, the best way to travel between Erdenet and Bulgan city is via Bugat village. It is rough going, but the 40km jeep trail goes through some of the most picturesque forests and gorgeous wildflowers in northern Mongolia (Bugat means 'Place of Elk'). Erdenet. Population 74,000. In the autonomous municipality of Orkhon, and not technically part of Bulgan aimag, Erdenet is Mongolia's third largest city. The reason for Erdenet's existence is the copper mine, which employs about 8000 people and is the lifeblood of the city. Erdenet is modern (built in 1974) and a bit soulless, but far nicer than most towns in the countryside. It is comparatively wealthy, so the facilities are the best outside of Ulaanbaatar. There is also a significantly large Russian community. Up to a third of the population of Erdenet was Russian during Communist times, though now only about 1000 Russians still work as technical advisers at the mine. Dashinchilen. There are a couple of minor monuments in Dashinchilen sum, in the South of the aimag, which might be of interest if you are travelling between Ulaanbaatar and Tsetserleg, via Ogii Nuur. On the west side of the Tuul Gol, about 35km north-east of Dashinchilen, are the ruins of Tsogt (Tsogt Tayjiin Tsagaan Balgas), a 17th century fort which was the home of the mother of Prince Tsogt, a 17th century poet who fought against Chinese rule. There is a stone stele nearby. Closer to the sum capital, the ruined Khar Bukh Fortress (Khar Bakhin Balgas), might be worth exploring as it's just a few kilometers North of the main road. Uran-Togoo Tulga Uul Natural Monument. Uran volcanoe (in Nothern part of image) and Tulga, Togoo, Jalavch volcanoes (in Southern part). Image is a SRTM DEM presentation with 30 m (100 feet) resolutionThe Uran-Togoo Tulga Uul Natural Monument (Mongolian: Уран-Тогоо Тулга уулын дурсгалт газар) is a national protected area in the Bulgan Province of Mongolia. It is located about 60km directly west of Bulgan city around the extinct volcanoes Uran Togoo, Tulga Togoo, and Jalavch Uul. The area is situated in the Khutag-Öndör district of Bulgan Province. A smaller area was initially protected in 1965 by State Great Khural Resolution No. 17. In 1995, it was designated as a monument by Parliament Resolution No. 26 with an area of 5,800 hectares. The map of Bulgan aimag.